You ARE still here, right? right?? tap, tap... is this thing on? I just celebrated my big 4-0 so it feels like a good time to wipe off the dust and cobwebs from my little slice of the Interwebz. And technically Lunzygras DOES last the entire month of April.... so I'm timely. kinda. I have just spent a long, exhausting ride on the crazy train. Our rental went up for sale as a short sale, we found a great house to buy, had a nightmare loan process, moved finally, blah blah blah. total cray cray. BigDaddy and I went to Maui to celebrate our 10th anniversary and my 40th birthday. alone. as in no little people with us for EIGHT splendid nights. Don't feel too badly for them, they got to hang out in CA with all the grandparents and get spoiled rotten. It was wonderful for us to re-connect and recharge our much depleted batteries. To say we were spent would be a huge understatement. Maui was key. and wonderful. and I want to be there... like now. 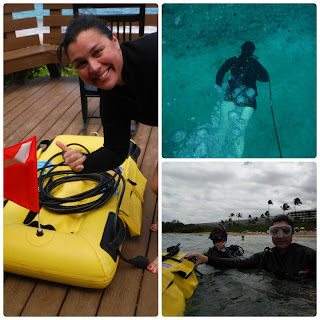 Me going out to Snuba/Huka in Makena Beach Reef! Maaaauuuii......Oh Lawdy.... Maui was wonderful. just what the doctor ordered. I instantly found myself in my happy place and yes, that happy place included adult beverages. We had a great time and this was our first vacation EVER that BigDaddy didn't work. for reals. So that was a huge bonus! So 40. yeah. I thought I should be feeling all weird and you know, OLD. But I l.o.v.e. my birthday. like so much so, that I turned it into a named, month-long event. And the vacationing didn't stop after Maui. One of my BFFs has her birthday 10 days after mine and threw a full-on, killer event.... complete with a hotel room block, pub crawl and party bus. And a Sober Coach to keep track of us! Thanks Steph! :D So off to SoCal I went. It's hard work being a travel bunny but somehow I mustered up the energy to make it happen. I met up with another girlfriend in LA who had also flown in. The weekend with my girls felt like playing hokey. A Non-Mom, Non-Wife, Not-responsible-for-anyone-else-period weekend. I laughed so hard my stomach ached for a few days. 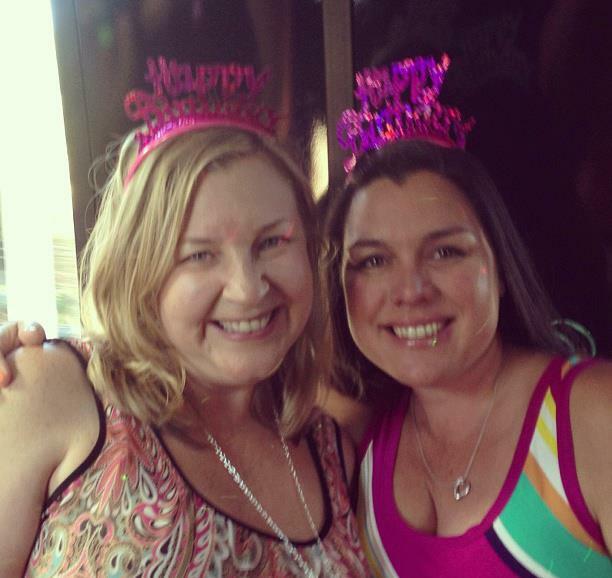 I did Jell-O shots and danced on a moving bus with black-out windows thankfully we had the stripper pole to hold on to! and I danced, danced, danced. Can you say Bliss? But something kicked in. I swear something changed. Maybe it was that I had finally had the chance to slow down in Maui and then be completely ready to Bring It in CA. I wasn't escaping, I was whooping it up. Whatever the case, I soaked it in. relished the moments. appreciated my time with these amazing people that were a part of my life. And I found my Lunzyness. More coming soon! pinky promise! Yes, it's true... we actually made it back to the West Coast! Same timezone as 90% of our family, same STATE as my sister and BFF from high school. AND we're just a two- hour, direct flight to the grandparents. All six of them. I still miss Virginia, but if we were going to leave the Kinda Country and my Village People, THIS is the place to do it for. and we ended up in the PNW Kinda Country. I've learned I'm now a total country mouse. I know, right? and we've found our little slice of semi-rural heaven in the PNW. No Mennonites or horse buggies, but we have geoducks and driftwood. We're not nestled in between the the Blue Ridge and Allenghenies, but we do have views the Cascades and Olympics. I'm not surrounded by rolling hills of yellowed winter grass, but I have moss. lots and lots of moss. and it's pretty amazing. like GORGEOUS. I'm surrounded in total gorgeousness. I can't believe we've been living here for eight months already! That really blows me a way. Five sentence recap: BigDaddy loves his new job, co-workers are awesome and his team is pretty fantastic. The munchkins are enjoying school and making friends. We found a trainer for Sass and she's become quite the equestrienne. BigBoy is a Wolf Scout. and get this... I have a J.O.B. The time I spent on this little ol' blog and my neglected Twitter account has paid off. I get to work with one of my favorite people AND get paid. Booyah! So when people have asked me why I haven't been blogging, I guess it's because I haven't felt the need to. It kept me company while BigDaddy was traveling so much. but then he was home. Then we embarked on our new diets (totally glulten free for BigBoy and me) and that seemed totally all consuming. then we moved, and then.... I was working. and ultimately, The Plan worked. I started my blog to make sure my skills weren't rusty, that I had enough up-to-date knowledge that I wasn't totally left behind saying a "Twittering What?" Mission Accomplished! But I miss my little space. I miss my Loyal Seven. and I feel like I have some stories to tell, some info to share, and some documentation I need to... well, document. So this is the place and it seems like this is the right time again. It IS actually lunzygras right now (the month of April) so grab your beads and cocktails and join me cuz I've miss YOU too!